St. Martin's Paperbacks, 9780312934910, 640pp. The news is shattering: The director of the CIA, Harrison Sinclair, has been killed in a car accident. Sinclair may have been a traitor—or the Agency's last honest man. Even his son-in-law, Ben Ellison, an attorney and ex-agent, has heard rumors of sinister forces within the Agency that could have ordered Sinclair's assassination. Soon he is thrust into a web of intrigue and violence beyond his control back into the CIA, and lured into a top-secret espionage project in telepathic ability funded by American intelligence. As the project's first success, Ben uses his "extraordinary powers" in the perilous search for Vladimir Orlov, the exiled former chairman of the KGB—and the only man who might unlock the secret of Sinclair's death and the whereabouts of a multibillion-dollar fortune in gold spirited out of Russia in the last days of the Soviet Union. 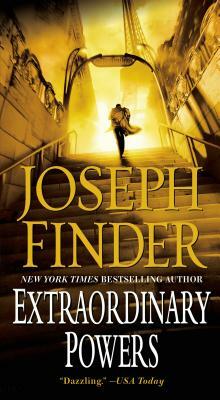 The hunt for the truth will bring Ben face to face with his past and culminate in a crowded Washington hearing room where, behind high security barriers, a Senate investigating committee is about to call its secret witness…as an assassin prepares to strike…in Joseph Finder's Extraordinary Powers.